"The story God & Mel Gibson don't want you to hear!!" What actually transpired Easter Week/Passover 33 A.D.? The Resurrection of Jesus of Nazareth was a Hoax! Culled from First Century Texts and drawn from dozens of biblical and secular sources, these monologues tell a revisionist tale of what transpired in Judea, Easter Week/Passover 33 AD and beyond during the reign of the Roman Emperor Tiberius. 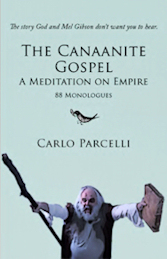 In the classical argots of Petronius, Rabelais, Chaucer, Shakespeare, Lenny Bruce, Guy Ritchie, James Joyce, David Jones, Cockney and the world's myriad cryptolects, The Canaanite Gospel strips bare the New Testament canard of the Resurrection of Yeshu of Nazareth and pokes a stick in the eye of the Synoptic Gospels. runs approximately 80 minutes with a 10 minute break. NOTE: For performances Mr. Parcelli appears in full 1st Century A.D. costume. The Canaanite Gospel is intended for ADULTS ONLY!! !